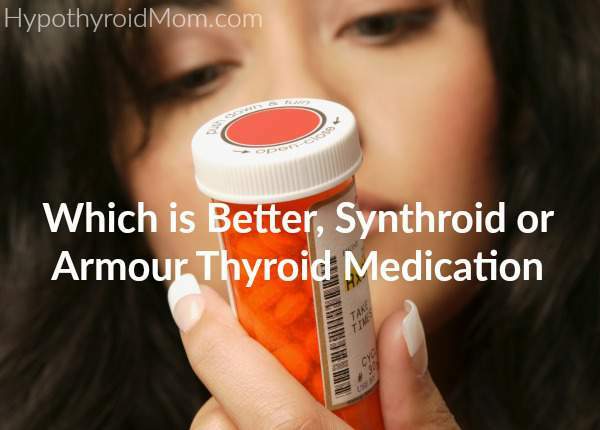 Which is the best thyroid medication for hypothyroidism? While some do great on T4-only levothyroxine medications like Synthroid, commonly prescribed by mainstream doctors, many of us continue to feel horrible on these drugs. My life changed when I found an open-minded thyroid doctor who listened, really listened, to me and my symptoms. Careful trial and error with thyroid medication brands and dosages and I found my “sweet spot”. With stress, age, and the onset of perimenopause, my “sweet spot” has changed over time, and thankfully each time we find my new “fabulous”. I take a combination of Nature-throid (a brand of natural desiccated thyroid) and a compound time-release T3 (created by a compounding pharmacy). Oh boy does dosage ever make a difference for me. I feel terrible when my Free T3 is low or even middle of the range. I feel fantastic when its at the top quarter of the normal range. Finding what is right for my body has been life-changing. I feel better today at 46 years old than I felt at 30…yes really. I hope the same for you. When you’re taking medicine, eating properly and still suffering, you might begin to wonder if your thyroid medication is the problem. It’s a valid thought process. Medication should help you feel better. While both are used to replace thyroid hormone, the differences are pretty substantial. I’d like to share those now so you can make more informed decisions about what you take. I think this could really help you figure out how to make the most of your medicine, lab work, and dietary supplements. Synthroid is a pure T4 drug and Armour Thyroid is an NDT drug (Natural Desiccated Thyroid) drug. The very names of these medications cause confusion. From now on, whenever you read “T4” you can think of that as the same exact hormone that is secreted from your thyroid gland. Synthroid is just a T4 hormone that is a medication. It requires prescription, and your own thyroid gland makes this naturally. T4 is not active in the body, it has to be processed and turned into T3 which does all the good stuff. Armour Thyroid is an NDT drug, which stands for Natural Desiccated Thyroid. It is a glandular medication that comes from animal sources. It combines T4 and T3 so sometimes people feel better on this because they are actually taking T3 hormone. Synthroid is a very popular medication that is pure T4, but there are other names this medication goes by. For example, Levothyroxine, Levothroid, Unithroid, and Tirosint. Armour Thyroid is an NDT medication that combines T4 and T3. There are other brand names that work in a similar way that are porcine-derived as well. These include Nature Throid (which is gluten free), WP Thyroid, and Erfa Thyroid (from Canada). There is also synthetic T3 (like Cytomel) and Compounded T4/T3 (created by specialty compounding pharmacies). 1. Synthroid is bio-identical to human T4 (thyroxine) hormone. Armour is derived from pigs, then purified, so it is not bio-identical to human thyroid hormone. 2. Synthroid is not derived from animals, it’s made in a laboratory. Armour is animal-derived and purified in a laboratory. More specifically, Armour is known as an NDT medication, short for Natural Desiccated Thyroid, and it is porcine-derived from the thyroid glands of pigs. 3. Synthroid contains T4 (thyroxine) only, whereas Armour contains both T4 and T3 (tri-iodothyronine). T3 is more biologically active than T4. 4. Synthroid’s actions may take a few hours, whereas Armour Thyroid will begin to work within an hour. What you should feel is more energy, some warmth if you are frequently cold, and more mental clarity. Your heart rate may increase a bit, but not to an uncomfortable level. 5. While possible, it’s unusual that Synthroid triggers an autoimmune response in a person with Hashimoto’s thyroiditis. Sometimes for people with Hashimoto’s their bodies ‘see’ the porcine-derived thyroid hormone and launch an attack against that because it is glandular. While rare, this explains why some of you with Hashimoto’s might feel a little better on Synthroid or a synthetic combo of T4 and T3 (such as taking a combination of Synthroid and Cytomel). It’s very individual of course. This is not a blanket statement, merely a consideration if you have Hashimoto’s and you feel worse on NDT drugs. 6. The inactive ingredients differ. Our bodies are all different in terms of sensitivities to these various ingredients which explains why some people react poorly to certain brands of thyroid medication. Synthroid- Inactive ingredients include acacia, confectioner’s sugar (contains corn starch), lactose monohydrate, magnesium stearate, povidone, and talc. Armour Thyroid- The inactive ingredients are calcium stearate, dextrose, microcrystalline cellulose, sodium starch glycolate and opadry white (colorant). 7. Synthroid may take approximately 4 weeks to cause any real alterations in your labwork, whereas Armour (and other NDT drugs) may impact your labwork within 2 weeks. Labs are usually drawn every month or two until symptoms have stabilized so expect to do a little trial and error. 8. Synthroid is measured in milligrams, Armour is measured as “grains” so if you switch between these medications, it’s difficult to figure out what dose you need. 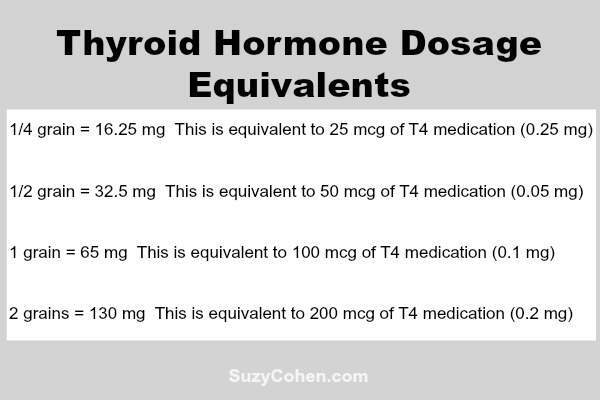 Later on in this article, you will find a handy list I created for you titled, Thyroid Hormone Dosage Equivalents. See below. 1. Neither one corrects auto-immune dysfunction they just help to restore thyroid hormone levels. This means that if you have an over-reactive immune system, it will continue to destroy your thyroid gland tissue despite the medicine you take. This is why there is more to Hashimoto’s than taking thyroid medication. Hashimoto’s is the number one cause of hypothyroidism, yet many hypothyroid patients have no idea because thyroid antibodies are not often tested in mainstream medicine. 2. They both have the potential to form Reverse T3 in your body. Both Synthroid and Armour Thyroid have the ability to create the hibernation hormone rT3 after you take them. If you have Reverse T3 levels that are high, the way to help yourself is not by changing medication, but rather by forcing the conversion of your medications in an active direction. Since T4 (thyroxine) can be metabolised in two directions, forming an active hormone, and an INactive hormone (rT3), it’s best to test yourself for levels of both free T3 and reverse T3. 3. Both medications are best taken in the morning because they produce energy, so if you take them at night, it could cause insomnia. (Although some people do great taking their medication before bed. We’re all individual. If you’re taking a T3 medication like natural desiccated thyroid, also speak to your doctor about whether splitting your dose so that you take half of your dose two times a day, for example half first thing in the morning and the other half in the early afternoon, instead of all at once might be more effective for you.) Both medications should be taken on an empty stomach. 4. For all practical purposes, the side effect profile is similar. Thyroid medications are stimulants so regardless of their brand name, they do the same thing. They turn on your fat-burning switch and they improve energy levels. 5. They both require a valid prescription in the United States. 6. Taking these medications will necessitate the need for the same exact lab tests. 7. Neither medication will prevent the development of thyroid cancer, one of the fastest growing cancers in the world. These medications are not anti-cancer, they are hormone replacement drugs. 8. Drinking coffee within 30 minutes of these drugs might significantly reduce their effectiveness. Wait at least one hour before eating and at least three to four hours before taking any vitamin with iron including multivitamins and prenatal vitamin supplements with iron. Synthroid doesn’t work until your body activates it. It is a T4 drug and your cells require T3 to effectively wake up, burn fat, and feel happy. So you have to convert the T4 into T3 and some medications get in the way of that. See below. Remember this point, if you’re low in T3 and you take a T4 drug, it’s like putting wiper fluid in your gas tank. It does you no good. If you are taking any of these medication, you may feel better on an NDT drug because a T4 drug will not easily convert to T3. Feeling good requires conversion of Synthroid (or any T4 drug) to its biologically active metabolite T3. In order for you to convert a T4 drug into a biologically active form, you need several vitamins and cofactors. So if you’re taking Synthroid, for example, then it might be a good idea to have the following nutrients on board (to help drive the conversion into a biologically active form). You don’t have to necessarily supplement (ask your doctor to test your levels), you could try to eat a clean, healthy diet. Having imbalances or deficiencies of these nutrients can prevent your ability to get well. Many people don’t realize that acid-reducing medications, estrogen-containing hormones, benzodiazepines, opiate analgesics, blood pressure pills, diuretics, statins, even coffee and wine could deplete levels of these nutrients, thus getting in the way of you feeling good. It’s what I call the Drug Mugger effect, based on the title of my book Drug Muggers: Which Medications Are Robbing Your Body of Essential Nutrients–and Natural Ways to Restore Them . If you take any of those medications, you might need to supplement with the above nutrients if you take a T4 drug. It’s a conversation to have with your physician because you might feel better on a pure T3 drug, a combination of T4 and T3, or NDT options. Iron deficiency, for example, leads to very poor T4 to T3 conversion, so you become clinically hypothyroid which slows metabolism. The net result is weight gain.You may think you’re tired because you have low iron, and less oxygen is carried around your body, but you’re probably not terribly anemic, it’s more likely that you are “thyroid sick” due to poor T3 activity. 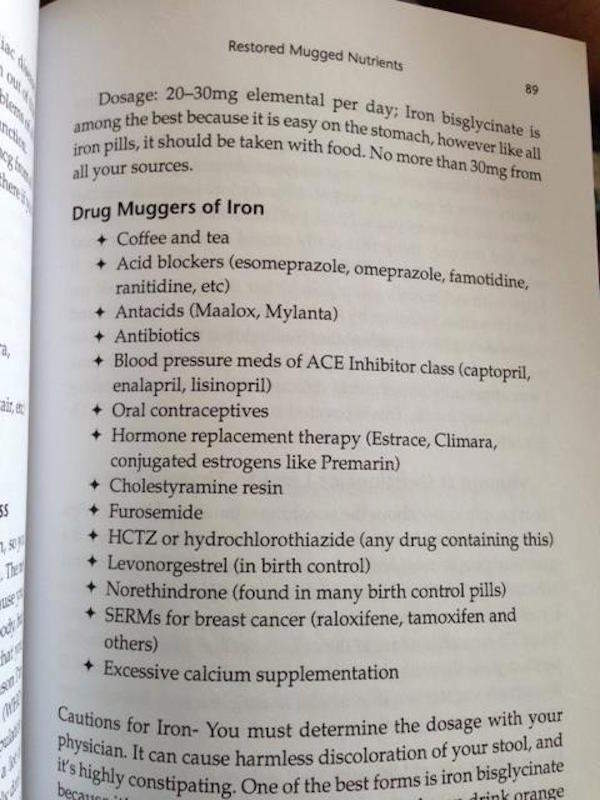 Take a look at all the drug muggers of iron on page 89 of my book Thyroid Healthy. So what is the right dose of medication? 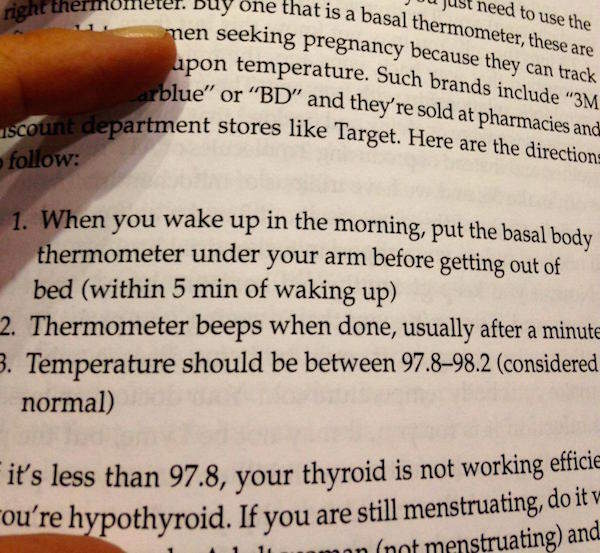 Have you checked your morning basal body temperature? 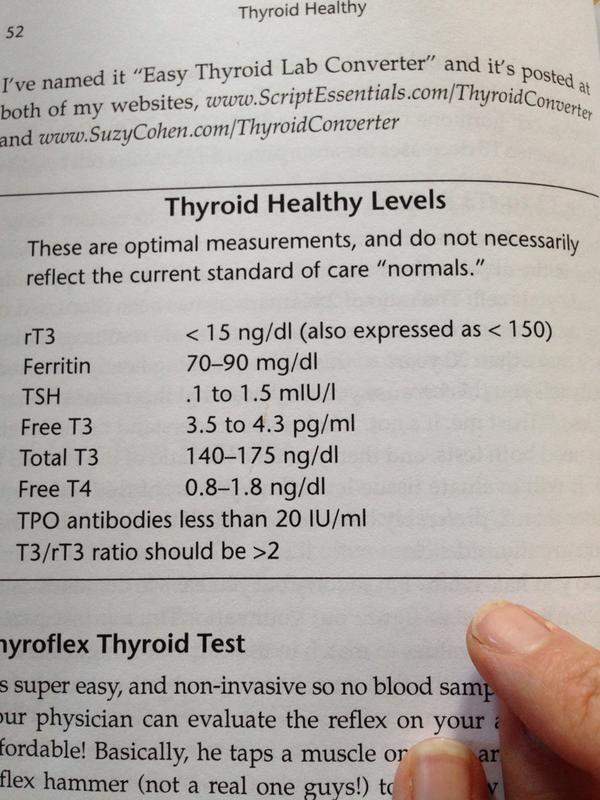 Here’s how from my book Thyroid Healthy. Here is page 52. Get a copy of your lab results and check that you’ve had all these tests done and that your levels are optimal not just normal. Most of you will begin a medication dose and based upon how you feel, you will either increase or decrease your dose. Hopefully you have a doctor who listens to you and your symptoms. If you develop palpitations, sweating and insomnia, you are taking too much. If you still feel cold, tired and remain overweight, you might need a higher dose, or a second dose during the day. Dosage changes should always be discussed with your physician. There will be times when you will go through life and have to increase your dosage. It’s hard to know exactly, but here’s a good rule of thumb. Based upon labs, if your free T3 is low, you might need Cytomel or Compounded T3 or NDT. Big life changes, maybe you’ve moved or lost your job, maybe you had a baby. During a crisis, you may need more adrenal support, you cannot have thyroid problems all by itself. The thyroid and adrenal work together. After surgery, it’s very common to need more medication or supplemental support. Keep in mind we are all unique and we have various sensitivities. Please don’t ever double up on your medication, that is dangerous. If you forget a dose, do not double up, just take it the next day when it is due. NDT porcine-derived drugs like Armour Thyroid are measured in “grains” not milligrams. T4 drugs like Synthroid are measured in milligrams. It’s sometimes difficult to figure out what you are taking, and how your dose has changed if the doctor alters your medication. The following chart might come in handy. What if you’re doing everything right, and you still feel bad? If you are taking thyroid medication, and still not feeling well, one big secret is that your adrenal glands are still not nourished. Your recovery will go faster if you think of your adrenal glands whenever you think of your thyroid gland. These two organs are connected through the HPA axis, the hypothalamic pituitary adrenal axis. There is a connection that most physicians dismiss, and if you only treat your thyroid gland, your recovery will be slower, or incomplete. Ashwagandha is a wonderful adaptogenic herb that supports both thyroid and adrenal health. It also induces relaxation, so if taken at night, it could help with relaxation. Suzy Cohen has been a licensed pharmacist for 25 years and is a functional medicine practitioner for the last 15. You may have seen Suzy on The Dr. OZ Show (6 different appearances), The View, The Doctors, Good Morning America Health, and hundreds of morning shows. Her supplement line called Script Essentials includes a supplement specially designed for thyroid disease called ThyroScript. Can you please say what pharmacy degree you have and where it is from? T3 levels. I have mild hypothyroid symptoms. Does upper quadrant levels of T3 cause the recurrence of the cancer? My doctor only wants T4 and TSH lab tests. With this type of cancer, I know T4 needs to be high enough to suppress TSH to 0.1 or below to prevent the return of the cancer. I want T3 levels high enough to feel good, BUT NOT IF IT MIGHT CAUSE THE RETURN OF THE CANCER. What should I do? I am 82, think I feel OK. Left thyroid is shriveled, small. My VA Physician’s Assistant wishes me to start Levothyroxine NA (synthoid) 25/ one quarter grain daily. I take no other medicine on a regular basis. Irregularly, Vitamin D 1000. Heart working good for its age. Should I introduce this T4 into my system. I have had sudden 8-minute dizzy spells about once a month for three months. Neurology exam upcoming. Any advice? Hashi’s patient here. Have been trying to stabilize since diagnosis in 2012. Started with OTC thyroid supps & had to move on to “natural” thyroid Rx. Tried all the brands & many dosage adjustments. Still felt bad & struggled with lots of symptoms. Am on a restricted diet and get lots of excercise. Have a healthcare background/training. Recently switched to synthroid and am amazed at the difference. Am not quite 100 percent but am so much better than with armour & the others. I do not trust meat based products to be pure, who knows where the cattle lived & what they ate & what kinds of chemicals & medications they were given. BTW I have only recently started to think about the actual source of animal thyroid – during all the years of taking animal thyroid Rx I did not really give it much thought. 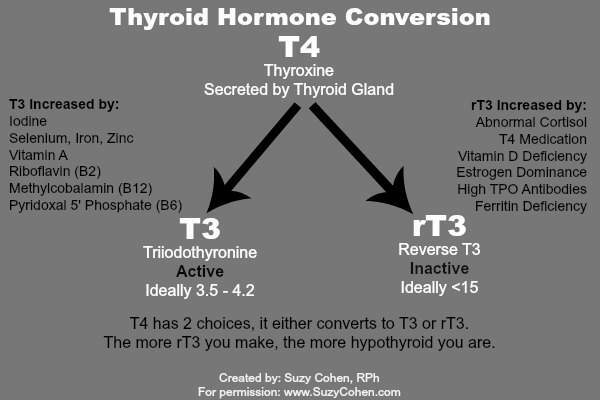 Also for me most likely the t3 in animal thyroid was causing some of my symptoms. Hope you find what works best for you & that you make progress toward feeling good! Thanks for letting me share. Sorry I wrote “cattle”. armour comes from pigs. But my concerns about corporate animal husbandry still stand. I have been taking levothyroxin for 40 years, diagnosed not long after having 2 babies close together. But I was diagnosed with celiac disease about 6/ years ago and recently with a dairy allergy. In spite of not eating gluten or dairy I still don’t feel that good so I looked up the ingredients in levothyroxine. It contains both gluten and lactose! I stopped taken the levothyroxine and I’m feeling so much better. But I’m not sure what I should do now. I have been taking Armour thyroid for almost 69 years. It is very hard to find a doctor to prescribe it and Medicare won’t cover one penny of it. When I found a doctor who was willing to prescribe it, he said that he didn’t even know what dose to give me because no one uses it anymore. I told him to just give me what I was taking and that was 26 years ago. I tried Synthroid and felt terrible on it. Also, the cost of Armour thyroid has skyrocketed. For me, it went from $33.00 to $226.00 for 3 months. As I said, my prescription drug plan doesn’t pay a penny. Sue, I just ordered a three-month supply of Armour for all of $83 with shipping, from HealthWarehouse.com. Where you get your medications from makes a huge difference in price. Whoever is charging you $226 is ripping you off. Medicare covers armour now! They just started covering it. Yay! I began levothyroxine in late October (when TSH was 6.99), and the TSH level was 2.66 by December. I also felt GREAT, like new. I mean, more energy than I could remember, without being too much. However, I noticed increased anxiety almost as soon as the med started. In early March, I had my levels checked again because of the anxiety. Now my TSH is 1.95. My T4 has gone from .7 in Oct to .94 in March. I have never been tested for T3. My energy level is still good, and I don’t want that to change, but I do want to address the anxiety, which I am sure is related to the med. Also, for the first few months, I was far less inclined towards depressed feelings, but this past month, have been feeling depressed. There were two major stressors for me the last week in Jan through mid Feb, so that would contribute, but I think the med is affecting me for sure. I am not sure what course to take. Would you have any advice? Can somebody help me? I normally take WP Thyroid but since no one here has it, my doctor called in prescription for Armour. Just picked it up and got home and see that it is levothyroxine/liothyron. Called the pharmacy and they told me this is the generic for Armour. Now I know that can’t be true since one is synthetic and the other is NDT. So I am wondering if this is okay to take. I have always been adamantly against synethics, but am also out of my meds and need to take something.